CLEAR LAKE, Iowa – It’s understandable if you have a curious urge early every February to scout up recordings of Buddy Holly’s “Peggy Sue,” Ritchie Valens’ “Donna” and the Big Bopper’s “Chantilly Lace.” Feb. 3 is the anniversary of “the day the music died” when the three early rock ‘n’ roll performers perished in a plane crash near this tiny Iowa town. Don McLean memorialized the tragedy in 1971 with “American Pie,” a song he told The Washington Post came to him “like a genie came out of a bottle.” McLean’s song was about the deaths, but it also was a metaphor for many changes in American society and is one noted in the National Recording Registry in the Library of Congress as being “culturally, historically or artistically significant.” This year, 2019, marks 60 years since the young stars’ Bonanza Beechcraft went down. 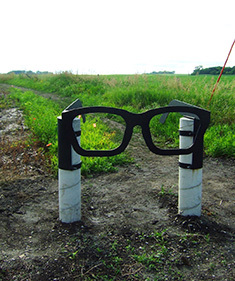 Buddy Holly path marker; image by Tom Adkinson. Each of the performers had a reason to be on the plane beyond wanting to avoid another 500-mile bus ride to their next show in Moorhead, Minn. J.P. Richardson (the Big Bopper) took Waylon Jennings’ seat because Richardson was ill; Valens won a coin toss to get his seat; and Holly wanted to go ahead of the group to do the band’s laundry. They took off after midnight but traveled only a few miles. The crash site was a farm field about six miles north of Clear Lake. 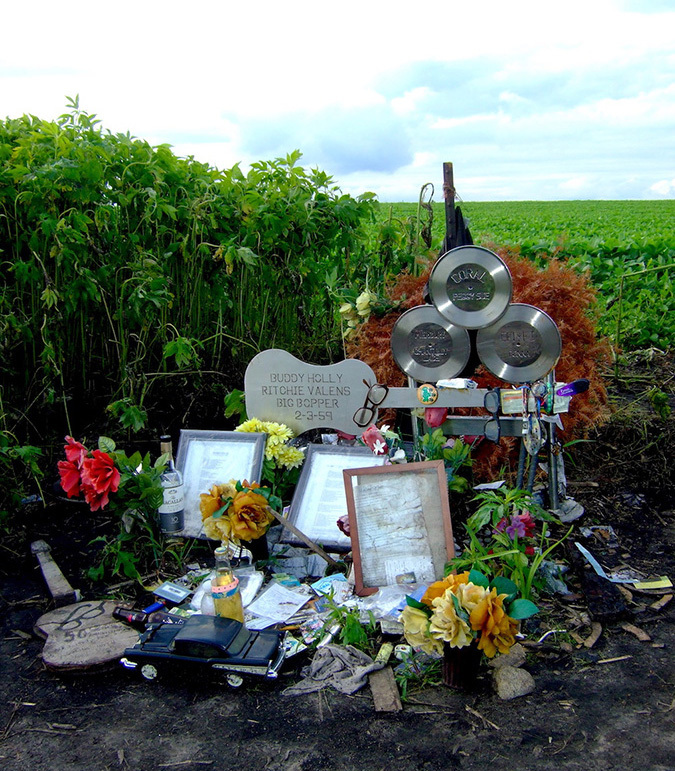 Today, fans visit the site and leave an assortment of items – flowers, framed poems, a guitar case, a model of Chevy sedan – while a giant pair of black-rimmed eyeglasses such as the ones Buddy Holly wore marks the spot on the country road where you begin your walk through the farm field and back into time.